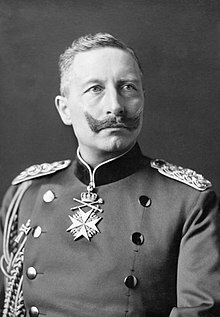 Wilhelm II (German : Friedrich Wilhelm Viktor Albert; 27 January 1859 –4 June 1941) was the last German Emperor (Kaiser) and King of Prussia, reigning from 15 June 1888 until his abdication on 9 November 1918 shortly before Germany's defeat in World War I. He was the eldest grandchild of Queen Victoria of the United Kingdom and related to many monarchs and princes of Europe, most notably his first cousin King George V of the United Kingdom and Emperor Nicholas II of Russia, whose wife, Alexandra, was Wilhelm and George's first cousin. Kaiser Wilhelm II abdicated as German Emperor and King of Prussia in November 1918. 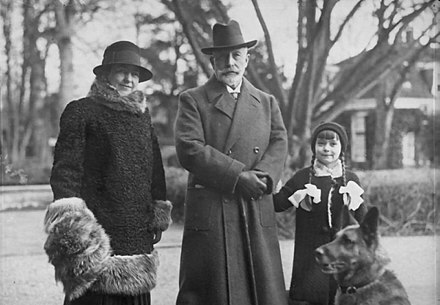 The abdication was announced on 9 November by Prince Maximilian of Baden and was formally enacted by Wilhelm's written statement on 28 November, made while in exile in Amerongen, the Netherlands. This ended the House of Hohenzollern's 500-year rule over Prussia and its predecessor state, Brandenburg. Wilhelm ruled Germany and Prussia from 15 June 1888 through 9 November 1918, when he went into exile. 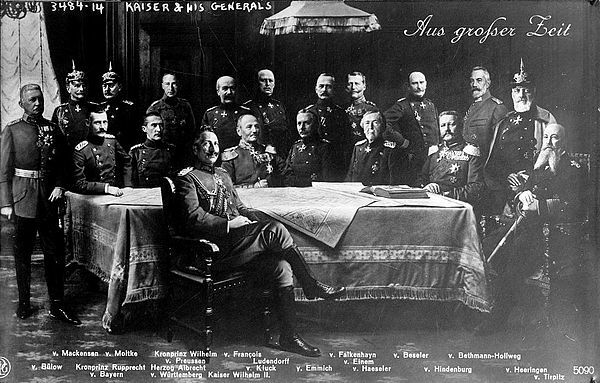 Following the abdication statement and German Revolution of 1918–19, the German nobility as a legally defined class was abolished. On promulgation of the Weimar Constitution on 11 August 1919, all Germans were declared equal before the law. 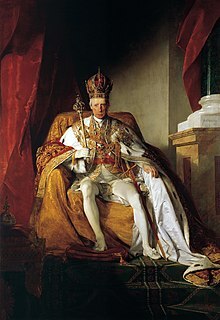 Ruling princes of the constituent states of Germany also had to give up their monarchical titles and domains, of which there were 22. 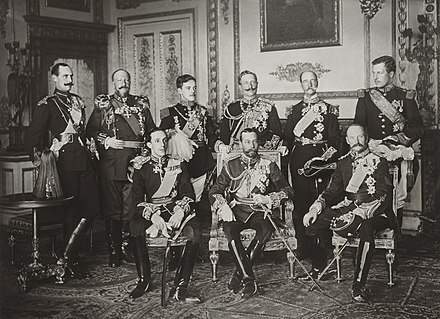 Of these princely heads of state, four held the title of king (könig), six held the title of grand duke (großherzog), five held the title of duke (herzog), and seven held the title prince. The German General Staff, originally the Prussian General Staff and officially Great General Staff, was a full-time body at the head of the Prussian Army and later, the German Army, responsible for the continuous study of all aspects of war, and for drawing up and reviewing plans for mobilization or campaign. It existed unofficially from 1806, and was formally established by law in 1814, the first general staff in existence. It was distinguished by the formal selection of its officers by intelligence and proven merit rather than patronage or wealth, and by the exhaustive and rigorously structured training which its staff officers undertook. Its rise and development gave the German armed forces a decisive strategic advantage over their adversaries for nearly a century and a half. The Kronprinzenpalais is a landmark late Neoclassical-style building at one end of Unter den Linden in Berlin. It was a palace of the ruling Hohenzollern house of Prussia until the abolition of the monarchy at the end of World War I. It then became an annexe of the Berlin National Gallery, housing a preeminent collection of modern art. It was closed by the Nazis and the building was destroyed in World War II. It was rebuilt in 1968 and used by East Germany as a guest house for official visitors to their capital of East Berlin. Since German reunification it has been used for exhibitions and cultural events. Victoria, Princess Royal was German Empress and Queen of Prussia by marriage to German Emperor Frederick III. She was the eldest child of Queen Victoria of the United Kingdom and Prince Albert of Saxe-Coburg and Gotha, and was created Princess Royal in 1841. She was the mother of Wilhelm II, German Emperor. 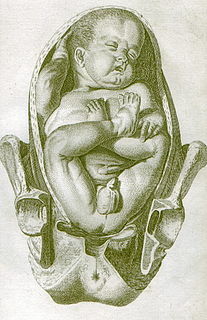 A breech birth is when a baby is born bottom first instead of head first. Around 3-5% of pregnant women at term have a breech baby. 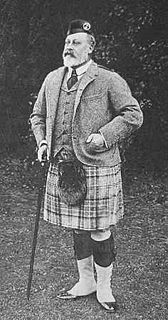 The term Highland dress describes the traditional, regional dress of the Highlands and Isles of Scotland. It is often characterised by tartan. Specific designs of shirt, jacket, bodice and headwear may also be worn along with clan badges and other devices indicating family and heritage. As a teenager he was educated at Kassel at the Friedrichsgymnasium. In January 1877, Wilhelm finished high school and on his eighteenth birthday received as a present from his grandmother, Queen Victoria, the Order of the Garter. After Kassel he spent four terms at the University of Bonn, studying law and politics. He became a member of the exclusive Corps Borussia Bonn . Wilhelm possessed a quick intelligence, but this was often overshadowed by a cantankerous temper. Crown Prince Frederick was viewed by his son with a deeply-felt love and respect. His father's status as a hero of the wars of unification was largely responsible for the young Wilhelm's attitude, as were the circumstances in which he was raised; close emotional contact between father and son was not encouraged. Later, as he came into contact with the Crown Prince's political opponents, Wilhelm came to adopt more ambivalent feelings toward his father, perceiving the influence of Wilhelm's mother over a figure who should have been possessed of masculine independence and strength. Wilhelm also idolised his grandfather, Wilhelm I, and he was instrumental in later attempts to foster a cult of the first German Emperor as "Wilhelm the Great". However, he had a distant relationship with his mother. 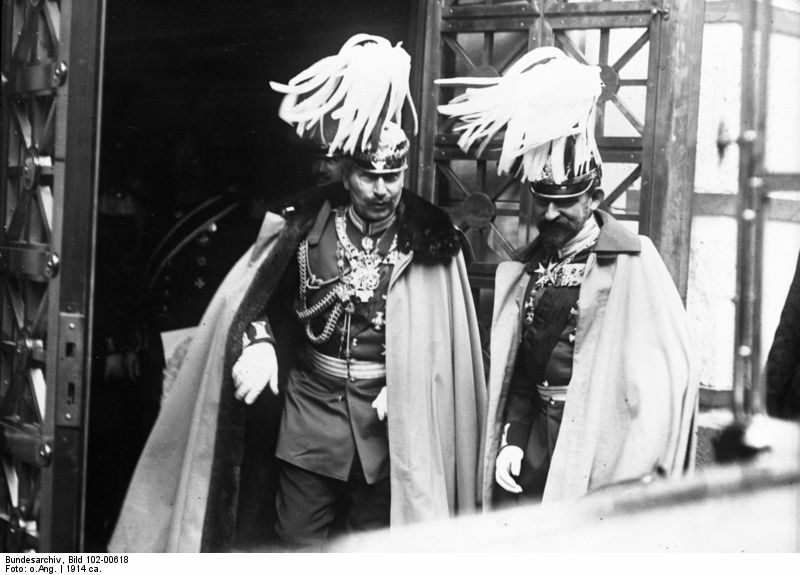 The impetuous young Kaiser rejected Bismarck's "peaceful foreign policy" and instead plotted with senior generals to work "in favour of a war of aggression". Bismarck told an aide, "That young man wants war with Russia, and would like to draw his sword straight away if he could. I shall not be a party to it." Bismarck, after gaining an absolute majority in favour of his policies in the Reichstag, decided to make the anti-Socialist laws permanent. His Kartell, the majority of the amalgamated Conservative Party and the National Liberal Party, favoured making the laws permanent, with one exception: the police power to expel Socialist agitators from their homes. The Kartell split over this issue and nothing was passed. Bismarck had sponsored landmark social security legislation, but by 1889–90, he had become disillusioned with the attitude of workers. In particular, he was opposed to wage increases, improving working conditions, and regulating labour relations. Moreover, the Kartell, the shifting political coalition that Bismarck had been able to forge since 1867, had lost a working majority in the Reichstag. At the opening of the Reichstag on 6 May 1890, the Kaiser stated that the most pressing issue was the further enlargement of the bill concerning the protection of the labourer. In 1891, the Reichstag passed the Workers Protection Acts, which improved working conditions, protected women and children and regulated labour relations. In appointing Caprivi and then Hohenlohe, Wilhelm was embarking upon what is known to history as "the New Course", in which he hoped to exert decisive influence in the government of the empire. [ citation needed ] There is debate amongst historians[ according to whom? ] as to the precise degree to which Wilhelm succeeded in implementing "personal rule" in this era, but what is clear is the very different dynamic which existed between the Crown and its chief political servant (the Chancellor) in the "Wilhelmine Era". [ original research? ] These chancellors were senior civil servants and not seasoned politician-statesmen like Bismarck. [ neutrality is disputed ] Wilhelm wanted to preclude the emergence of another Iron Chancellor, whom he ultimately detested as being "a boorish old killjoy" who had not permitted any minister to see the Emperor except in his presence, keeping a stranglehold on effective political power. 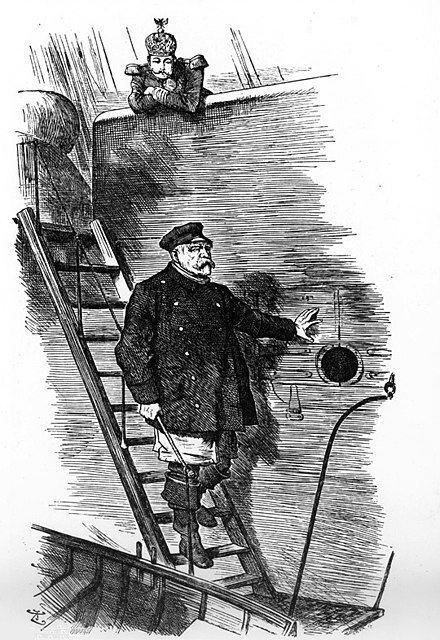 [ citation needed ] Upon his enforced retirement and until his dying day, Bismarck became a bitter critic of Wilhelm's policies, but without the support of the supreme arbiter of all political appointments (the Emperor) there was little chance of Bismarck exerting a decisive influence on policy. In the early twentieth century Wilhelm began to concentrate upon his real agenda; the creation of a German navy that would rival that of Britain and enable Germany to declare itself a world power. He ordered his military leaders to read Admiral Alfred Thayer Mahan's book, The Influence of Sea Power upon History , and spent hours drawing sketches of the ships that he wanted built. Bülow and Bethmann Hollweg, his loyal chancellors, looked after domestic affairs, while Wilhelm began to spread alarm in the chancellories of Europe with his increasingly eccentric views on foreign affairs. 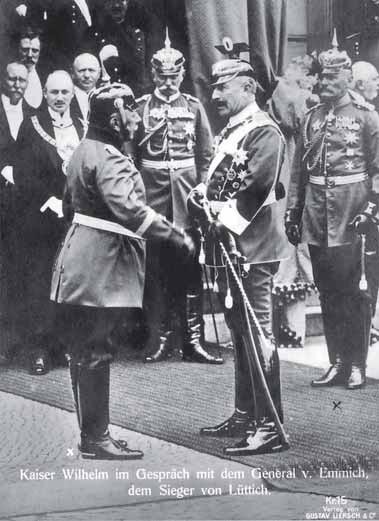 Wilhelm's most contentious relationships were with his British relations. He craved the acceptance of his grandmother, Queen Victoria, and of the rest of her family. Despite the fact that his grandmother treated him with courtesy and tact, his other relatives found him arrogant and obnoxious, and they largely denied him acceptance. 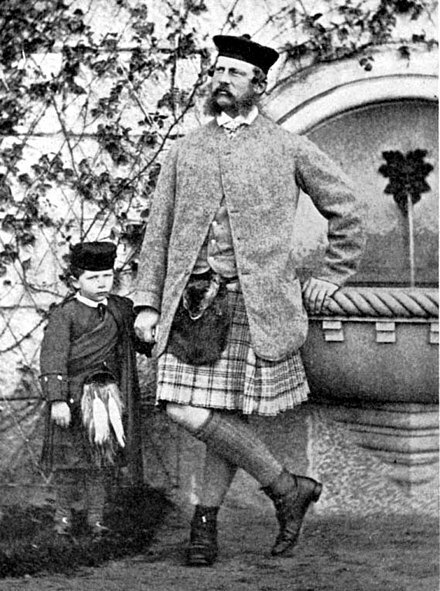 He had an especially bad relationship with his Uncle Bertie, the Prince of Wales (later King Edward VII). Between 1888 and 1901 Wilhelm resented his uncle, himself a mere heir to the British throne, treating Wilhelm not as Emperor of Germany, but merely as another nephew. In turn, Wilhelm often snubbed his uncle, whom he referred to as "the old peacock" and lorded his position as emperor over him. Beginning in the 1890s, Wilhelm made visits to England for Cowes Week on the Isle of Wight and often competed against his uncle in the yacht races. 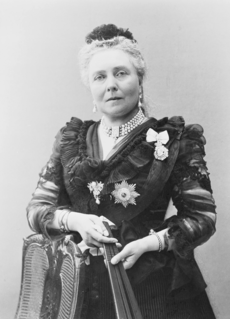 Edward's wife, the Danish-born Alexandra, first as Princess of Wales and later as Queen, also disliked Wilhelm, never forgetting the Prussian seizure of Schleswig-Holstein from Denmark in the 1860s, as well as being annoyed over Wilhelm's treatment of his mother. Despite his poor relations with his English relatives, nevertheless, when he received news that Queen Victoria was dying at Osborne House in January 1901, Wilhelm travelled to England and was at her bedside when she died, remaining for the funeral. He also was present at the funeral of King Edward VII in 1910. 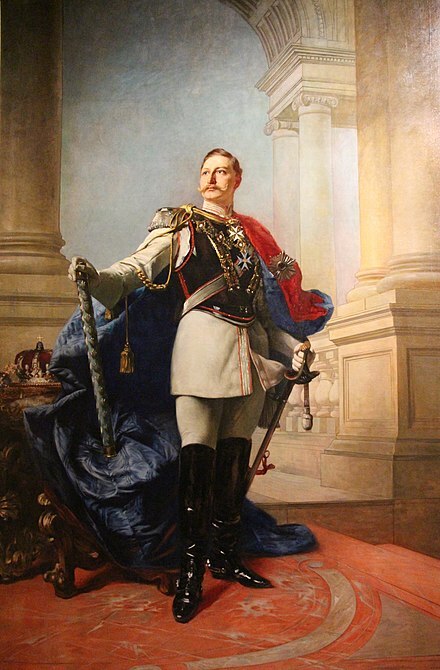 German foreign policy under Wilhelm II was faced with a number of significant problems. Perhaps the most apparent was that Wilhelm was an impatient man, subjective in his reactions and affected strongly by sentiment and impulse. He was personally ill-equipped to steer German foreign policy along a rational course. It is now widely recognised that the various spectacular acts which Wilhelm undertook in the international sphere were often partially encouraged by the German foreign policy elite. [ according to whom? ] There were a number of notorious examples, such as the Kruger telegram of 1896 in which Wilhelm congratulated President Paul Kruger of the Transvaal Republic on the suppression of the British Jameson Raid, thus alienating British public opinion. 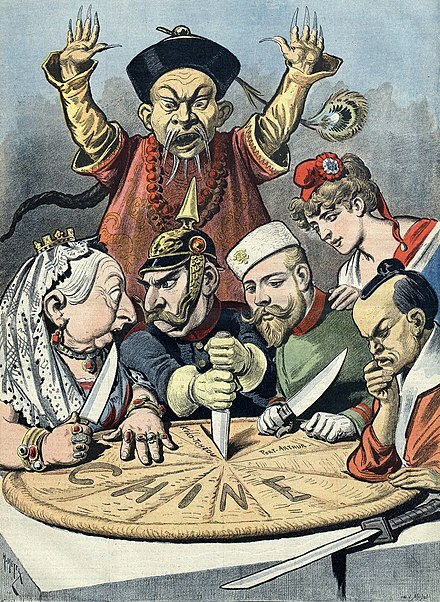 Wilhelm invented and spread fears of a yellow peril trying to interest other European rulers in the perils they faced by invading China; few other leaders paid attention. 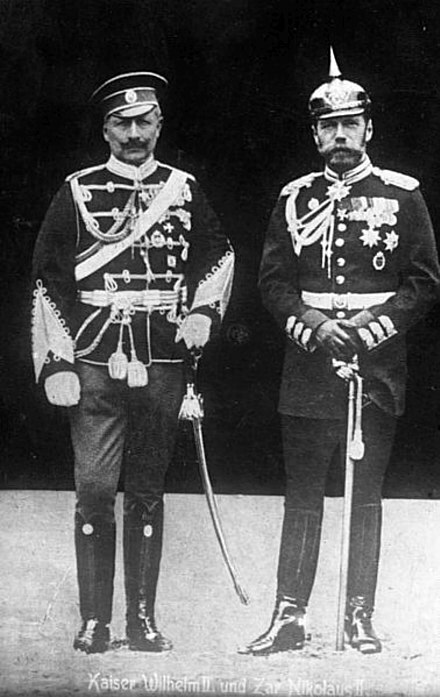 Wilhelm used the Japanese victory in the Russo-Japanese War to try to incite fear in the west of the yellow peril that they faced by a resurgent Japan, which Wilhelm claimed would ally with China to overrun the west. Under Wilhelm, Germany invested in strengthening its colonies in Africa and the Pacific, but few became profitable and all were lost during the First World War. In South West Africa (now Namibia), a native revolt against German rule led to the Herero and Namaqua Genocide, although Wilhelm eventually ordered it to be stopped. On 10 November, Wilhelm went to visit Baalbek before heading to Beirut to board his ship back home on 12 November. In his second visit, Wilhelm secured a promise for German companies to construct the Berlin-Baghdad railway,  and had the German Fountain constructed in Constantinople to commemorate his journey. One of Wilhelm's diplomatic blunders sparked the Moroccan Crisis of 1905, when he made a spectacular visit to Tangier, in Morocco on March 31, 1905. He conferred with representatives of Sultan Abdelaziz of Morocco. The Kaiser proceeded to tour the city on the back of a white horse. The Kaiser declared he had come to support the sovereignty of the Sultan—a statement which amounted to a provocative challenge to French influence in Morocco. The Sultan subsequently rejected a set of French-proposed governmental reforms and issued invitations to major world powers to a conference which would advise him on necessary reforms. 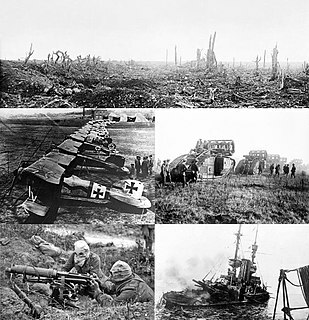 When it became clear that Germany would experience a war on two fronts and that Britain would enter the war if Germany attacked France through neutral Belgium, the panic-stricken Wilhelm attempted to redirect the main attack against Russia. When Helmuth von Moltke (the younger) (who had chosen the old plan from 1905, made by General von Schlieffen for the possibility of German war on two fronts) told him that this was impossible, Wilhelm said: "Your uncle would have given me a different answer!" Wilhelm is also reported to have said, "To think that George and Nicky should have played me false! If my grandmother had been alive, she would never have allowed it." In the original Schlieffen plan, Germany would attack the (supposed) weaker enemy first, meaning France. The plan supposed that it would take a long time before Russia was ready for war. Defeating France had been easy for Prussia in the Franco-Prussian War in 1870. At the 1914 border between France and Germany, an attack at this more southern part of France could be stopped by the French fortress along the border. However, Wilhelm II stopped any invasion of the Netherlands. Barry Foster plays Wilhelm II in several episodes of the 1974 BBC TV series Fall of Eagles . Rupert Julian played Wilhelm II in the 1918 Hollywood propaganda film The Kaiser, the Beast of Berlin . Alfred Struwe played Wilhelm in the 1987 Polish historical drama film Magnat . Christopher Plummer played Wilhelm II in the 2016 fictitious romantic war drama The Exception . The Year of the Three Emperors, or the Year of the Three Kaisers, refers to the year 1888 during the German Empire in German history. The year is considered to have memorable significance because of the deaths of two German Emperors, or Kaisers, leading to a rapid succession of three monarchs within one year. The three different emperors who ruled over Germany during this year were Wilhelm I, Frederick III, and Wilhelm II. The mnemonic “drei Achten, drei Kaiser” is still used today in Germany by children and adults alike to learn the year in question. Bernhard Heinrich Karl Martin von Bülow, created Fürst von Bülow in 1905, was a German statesman who served as Secretary of State for Foreign Affairs for three years and then as Chancellor of the German Empire from 1900 to 1909. Alfred Ludwig Heinrich Karl Graf von Waldersee was a German field marshal (Generalfeldmarschall) who became Chief of the Imperial German General Staff. Augusta Victoria of Schleswig-Holstein was the last German empress and queen of Prussia by marriage to Wilhelm II, German Emperor. 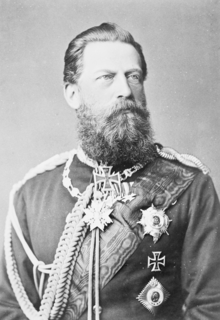 Prince Albert William Henry of Prussia was a younger brother of German Emperor William II and a Prince of Prussia. He was also a grandson of Queen Victoria. A career naval officer, he held various commands in the Imperial German Navy, eventually rose to the rank of Grand Admiral and Generalinspekteur der Marine. Princess Victoria Louise of Prussia was the only daughter and the last child of German Emperor Wilhelm II and Augusta Victoria of Schleswig-Holstein. She was a great-granddaughter of Queen Victoria through her father. Her 1913 marriage to Prince Ernest Augustus of Hanover was the largest gathering of reigning monarchs in Germany since German unification in 1871, and one of the last great social events of European royalty before the First World War began fourteen months later. 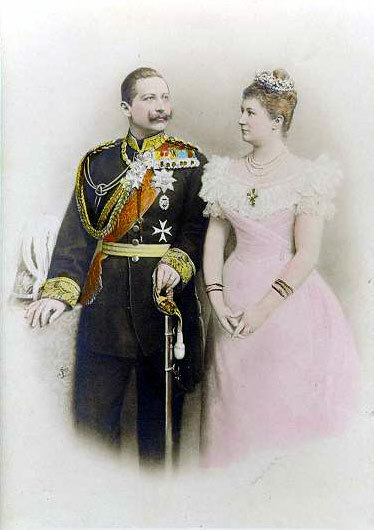 Duchess Cecilie of Mecklenburg-Schwerin was the last German Crown Princess and Crown Princess of Prussia as the wife of German Crown Prince Wilhelm, the son of German Emperor Wilhelm II. Princess Hermine Reuss of Greiz, widowed Princess of Schönaich-Carolath, was the second wife of Wilhelm II (1859–1941). They were married in 1922, four years after he had abdicated as German Emperor and King of Prussia. Georg Alexander von Müller was an Admiral of the Imperial German Navy and a close friend of the Kaiser in the run up to the First World War. Prince Karl Franz of Prussia was the only child of Prince Joachim of Prussia and his wife Princess Marie-Auguste of Anhalt. He was also the grandson of Wilhelm II, German Emperor, himself a grandson of Queen Victoria, which made Prince Karl a great-great-grandson of the British queen. ↑ Cosmos Greek Documentaries (9 October 2016). "Queen Victoria and the Crippled Kaiser - Ντοκιμαντερ" – via YouTube. ↑ Massie 1991, p. 27. 1 2 Massie 1991, p. 28. ↑ Clay 2007, p. 14. ↑ Massie 1991, p. 29. ↑ Hull 2004, p. 31. ↑ Massie 1991, p. 33. ↑ Röhl 1998, p. 12. ↑ Massie 1991, p. 34. ↑ Lamar Cecil, Wilhelm II, vol 1: Prince and Emperor, 1859-1900 (1989) pp 110-23. ↑ Cecil, Wilhelm II, vol 1: Prince and Emperor, 1859-1900 (1989) pp 124-46. ↑ John C. G. Röhl (2014). Kaiser Wilhelm II: A Concise Life. Cambridge UP. p. 44. ISBN 9781107072251. ↑ Cecil, Wilhelm II, vol 1: Prince and Emperor, 1859-1900 (1989) pp 147-70. ↑ Gauss 1915, p. 55. ↑ Taylor 1967, pp. 238–39. ↑ König 2004, pp. 359–377. ↑ Clark 2003, pp. 38–40, 44. ↑ Sainty 1991, p. 91. ↑ Nipperdey 1992, p. 421. ↑ Fromkin 2008, p. 110. ↑ Fromkin 2008, p. 87. ↑ Langer 1968, p. 528. ↑ LaMar Cecil (1996). Wilhelm II: Emperor and Exile, 1900–1941. UNC. p. 57. ISBN 9780807822838. ↑ Reinermann 2008, pp. 469–85. ↑ Röhl 1996, p. 203. ↑ Cecil 1996, p. 14. ↑ Cecil 1996, pp. 9. 1 2 "Alman Çeşmesi". Archived from the original on 27 September 2007. Retrieved 2006-09-16. 1 2 Abdel-Raouf Sinno (1998). "The Emperor's visit to the East: As reflected in contemporary Arabic journalism" (PDF). ↑ Wolf von Schierbrand; A. Oscar Klaussmann (1903). The kaiser's speeches: Forming a character portrait of Emperor William II. Harper & Brothers Publishers. p. 320–321. 1 2 ""Hun Speech": Kaiser Wilhelm II's Address to the German Expeditionary Force Prior to its Departure for China (July 27, 1900)". German History in Documents and Images. Retrieved 24 December 2012. 1 2 3 Dunlap, Thorsten. "Wilhelm II: "Hun Speech" (1900)". German History in Documents and Images. Retrieved 24 December 2012. ↑ Chisholm, Hugh, ed. (1911). "Morocco". Encyclopædia Britannica . 18 (11th ed.). Cambridge University Press. p. 858. ↑ Cecil 1996, pp. 91–102. ↑ John C. G. Röhl (2014). 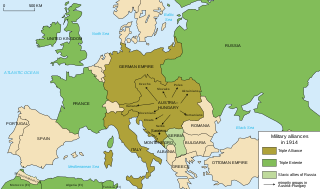 Wilhelm II: Into the Abyss of War and Exile, 1900–1941. Cambridge University Press. pp. 662–95. ISBN 9781107728967. ↑ "The Daily Telegraph Affair". ↑ Cecil 1996, vol. 2, pp. 135–7, 143–45. ↑ Cecil 1996, vol. 2, pp. 138–41. ↑ Carl L. Boyd, "The Wasted Ten Years, 1888–1898: The Kaiser Finds an Admiral." Royal United Services Institution. Journal 111.644 (1966): 291-297. ↑ Lamar Cecil, Wilhelm II: Emperor and Exile, 1900-1941 - Vol. 2 (1996) pp 152-73. ↑ Lamar Cecil, Wilhelm II, vol. ii: Emperor and Exile, 1900–1941 (1996), p. 212. ↑ Ludwig 1927, p. 444. ↑ Balfour 1964, pp. 350–51. ↑ Ludwig 1927, p. 453. ↑ Balfour 1964, p. 355. ↑ Craig, pp. 374, 377–78, 393. ↑ "No. 30186". The London Gazette . 17 July 1917. p. 7119. ↑ Cecil 1996, p. 283. ↑ Schwabe 1985, p. 107. ↑ Palmer 1976, p. 267. ↑ Taylor 1967, p. 264. ↑ Cecil 1996, vol. 2 p. 294. ↑ Macdonogh 2001, p. 426. ↑ Macdonogh 2001, p. 457. ↑ Macdonogh 2001, pp. 452–52. ↑ Macdonogh 2001, p. 456. ↑ Balfour 1964, p. 419. ↑ "The Kaiser on Hitler" (PDF). Ken. 15 December 1938. Retrieved 2 October 2016. 1 2 Petropoulos 2006, p. 170. ↑ Palmer 1978, p. 226. ↑ Martin 1994, p. 523. 1 2 3 Röhl, John C. G. (2014). Conflict, Catastrophe and Continuity: Essays on Modern German History. Cambridge University Press. p. 1263. ISBN 9780521844314. 1 2 Röhl, p. 211. ↑ Pakula 1995, p. 602. ↑ Sweetman 1973, pp. 654–55. ↑ Macdonogh 2001, p. 459. ↑ Goetz 1955, pp. 21–44. ↑ New York Times 1913. ↑ Röhl 1994, p. 10. ↑ McLean 2001, pp. 478–502. ↑ Berghahn 2003, pp. 281–93. ↑ Dudoignon, Stephane A.; Hisao, Komatsu; Yasushi, Kosugi, eds. (2006). Intellectuals in the Modern Islamic World: Transmission, Transformation and Communication. Routledge. p. 188. ISBN 9781134205974. ↑ Motadel, David, ed. (2014). Islam and the European Empires (illustrated ed.). Oxford University Press. pp. 244–5. ISBN 9780199668311. ↑ Jacob M. Landau (2015). Pan-Islam: History and Politics. Routledge. p. 46. ISBN 9781317397533. ↑ "How Recep Tayyip Erdogan seduces Turkish migrants in Europe". The Economist . 31 August 2017. Retrieved 2 September 2017. ↑ Edward Jewitt Wheeler; Isaac Kaufman Funk; William Seaver Woods (1920). The Literary Digest. pp. 3–. 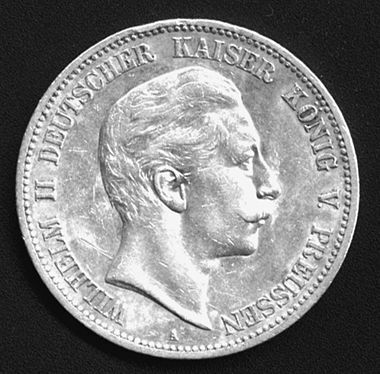 1 2 "Wilhelm II, German Emperor & King of Prussia (1859–1941)". Archived from the original on 15 October 2007. Retrieved 4 November 2018. ↑ "Frauen-Verdienstkreuz 1892". Ehrenzeichen-orden.de. Retrieved 24 December 2018. ↑ "Jerusalem-Erinnerungskreuz 1898". Ehrenzeichen-orden.de. Retrieved 23 December 2018. ↑ Jørgen Pedersen (2009). Riddere af Elefantordenen, 1559–2009 (in Danish). Syddansk Universitetsforlag. p. 468. ISBN 978-87-7674-434-2. ↑ "Image: 01-Romania-in-Primul-Razboi-Mondial.jpg, (800 × 575 px) – Kaiserul Wilhelm al II lea şi prinţul moştenitor Ferdinand al României la Berlin. Începând din 1893, România a avut un tratat de alianţă cu Puterile Centrale, Germania şi Austro-Ungaria, tratat la care a renunţat în 1916 când a intrat în Primul Război Mondial de Partea Antantei". george-damian.ro. Archived from the original on 6 March 2016. Retrieved 6 September 2015. ↑ "The Order of the Norwegian Lion", The Royal House of Norway. Retrieved 10 August 2018. Associated Press (15 March 1890), The Kaiser's Conference – Trying to Solve the Workingmen's Problem. 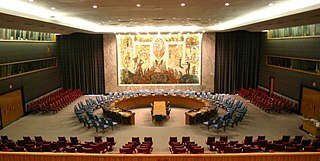 Formal Organization of the Delegates in Berlin – Seeking a New Government Combination, The New York Times , retrieved 15 February 2012 . Berghahn, Volker (2003), "Structure and Agency in Wilhelmine Germany: The history of the German Empire, Past, present and Future", in Mombauer, Annika; Deist, Wilhelm, The Kaiser: New Research on Wilhelm II's Role in Imperial Germany, Cambridge University Press, ISBN 978-0-521-82408-8 , 299 pp. ; 12 scholar essays. Butler, David Allen (2010), THE BURDEN OF GUILT: How Germany Shattered the Last Days of Peace, Summer 1914, Casemate Publishers, ISBN 9781935149576 , retrieved 15 July 2012 . Goetz, Walter (Feb 1955), "Kaiser Wilhelm II. und die Deutsche Geschichtsschreibung" [Kaiser William II and German historiography], Historische Zeitschrift (in German), 179 (1) . New York Times (8 June 1913), KAISER, 25 YEARS A RULER, HAILED AS CHIEF PEACEMAKER; Men of Mark in and Out of His Dominions Write Exclusively for The New York Times Their High Opinion of His Work in Behalf of Peace and Progress During the Quarter Century That Has Elapsed Since He Became King of Prussia and German Emperor, The New York Times , retrieved 22 February 2012 . Reinermann, Lothar (Oct 2008), "Fleet Street and the Kaiser: British Public Opinion and Wilhelm II", German History, 26 (4): 469–485, doi:10.1093/gerhis/ghn046 . Weinert, Christoph (2007), Wilhelm II. – Die letzten Tage des Deutschen Kaiserreichs [William II – The last days of the German Monarchy] (in German), Germany/Belgium: seelmannfilm and German Television, archived from the original on 2013-02-10 . 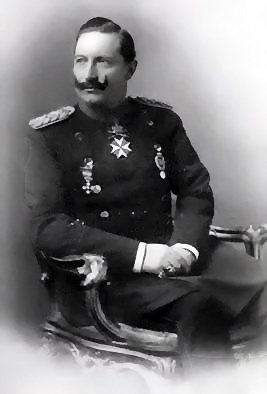 Wikimedia Commons has media related to Wilhelm II of Germany .